In 1870, Mutual of New York was leading 13-12 in the deciding game of its series with the Chicago White Stockings when Mutual left the field in protest. Officials decided to revert the score to the end of the last completed inning and awarded the game, and thus the championship, to Chicago. The Mutual club declared itself champion. The Mutual Base Ball Club of New York was a leading American baseball club almost throughout its 20-year history. It was established during 1857, the year of the first baseball convention, just too late to be a founding member of the National Association of Base Ball Players. 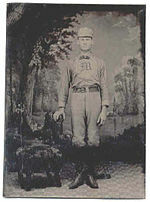 It was a charter member of both the first professional league in 1871 and the National League in 1876. Failing on the field and in the coffer, it declined to make its last western trip of the inaugural season. For the transgression it was expelled in December, and soon found itself defunct. The Mutual club initially played its home games at Elysian Fields in Hoboken, with the New York Knickerbockers and many other Manhattan clubs, but moved to the enclosed Union Grounds in Brooklyn in 1868. Though historically identified as "New York", they never staged any home games in Manhattan. The Mutuals chose open professionalism in 1869–70 after NABBP liberalization. They joined the first professional league, the National Association of Professional Base Ball Players, for its 1871 to 1875 duration. In 1876, the Chicago White Stockings initiated the National League and recruited its members from West to East, partly to wrest control of professional baseball from Eastern interests. The Mutuals were one of eight charter members, six of whom were from the National Association. Weak (sixth place at 21–35) and cash-poor, the club refused to complete its playing obligations in the West; and was expelled. 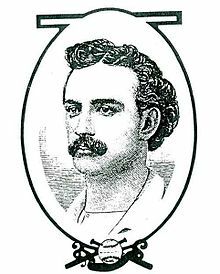 On May 13, 1876, the Mutuals executed the first triple play in major-league history in a game against the Hartford Dark Blues. Union Grounds proprietor William Cammeyer, often listed today as the Mutual club owner, signed the Hartford Dark Blues to play at his Union Grounds in 1877. The team was effectively a one-year replacement for the defunct Mutuals, and was sometimes called "Hartford of Brooklyn". Source for season records: Rio (2008). Baseball-Reference. "New York Mutuals Team Index" (1871–1875). Retrieved 2006-09-17. Retrosheet. "New York Mutuals (1871–1876)". Retrieved 2006-09-17. This page was last edited on 22 January 2019, at 16:40 (UTC).